The satirical scenes of the celebrated English artist William Hogarth (1697–1764) are iconic representations of eighteenth-century urban life at a time of great socio-economic disparity. An academic outsider and an activist, Hogarth was driven to innovate, creating new genres and modes of expression in his painting, printmaking, and drawing in his effort to elevate the status of British art. This exhibition will investigate the ways the artist used humor, satire, and political commentary to engage a broad audience and agitate for legislation and political goals. 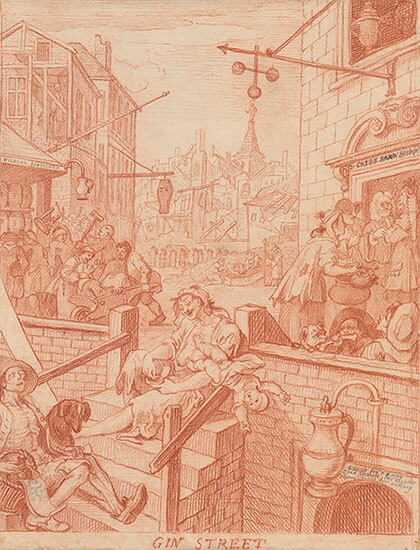 The exhibition features the Morgan’s exceptional cache of six sheets preparatory for two of Hogarth’s most revered print series, both issued in February 1751: Beer Street and Gin Lane and The Four Stages of Cruelty. The story of Hogarth’s images reveal an artist who addressed the ills and injustices of life in a modern metropolis, exploring the connections between violence, crime, alcohol abuse, and cruelty to animals in ways that would amuse, occasionally shock, and edify his audience. Hogarth: Cruelty and Humor is made possible with generous support from Joshua W. Sommer and Alyce W. Toonk, and assistance from the Alex Gordon Fund for Exhibitions and Raphael and Jane Bernstein. William Hogarth (1697–1764), Gin Street, 1750–51, red chalk, some graphite, on paper, incised with stylus. The Morgan Library & Museum, Purchased by Pierpont Morgan (1837–1913) in 1909.